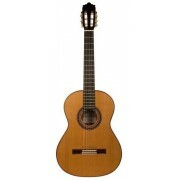 Guitar from Spain, through its website www.guitarfromspain.com, reserves the right to modify the commercial offer presented on the website (changes of products, prices, promotions and other sales and services) at any time. We make every effort to make the information herein as accurate as possible. Notwithstanding, we reserve the right to correct any inadvertent or typographical errors, without notice. Should we detect a typographical error in any of the prices shown on any page of this website, and a client has made a purchase decision based on that error, we will notify the client of the error immediately and the customer reserves the right to terminate said purchase without cost. Prices of items will not be mandatory in case of typographical error. The contents of the website guitarfromspain.com may sometimes contain provisional information on some products. In the event that the information provided does not correspond to the characteristics of the product, the customer is entitled to cancel the order without cost. The photographs of our products are indicative and are subject to aesthetic changes introduced by each manufacturer. At Guitar From Spain we strive to show true images to the final product, but the tone or color of the products shown may vary slightly from the product received. All purchases are charged in Euros. You can pay in local currency through Paypal or credit card if desired. Our currency converter is a reference for your convenience, and at no time represents a commitment to sell at that conversion. The issuer of your credit card may offer you an exchange rate different the one shown in our currency reference tab. The currency exchange fees charged by Paypal, or the issuer of your credit card, are not the responsibility of Guitar From Spain. Likewise if you choose to pay by bank transfer, bank charges or other expenses arising from the bank transfer, must be paid by the buyer. The prices of the products displayed on the website www.guitarfromspain.com include value added tax (VAT), applied to countries within the European Union. Purchases made and delivered within the territory of any of the countries of the EU are subject to VAT. The prices of the products displayed on the website www.guitarfromspain.com don't include value added tax (VAT), to countries outside of the European Union. Purchases offered in the Canaries, Ceuta, Melilla or territories of countries not members of the European Union are exempt from VAT. Import taxes and customs charges are not included in shipments to countries outside the European Union and must be paid in the country of destination by the customer. Packages are usually dispatched within 3 - 10 working days, or under, after receipt of payment, and are shipped via UPS, FEDEX, Correos Express or TNT with tracking and signed-for proof of delivery recorded. Note that many of our guitars are supplied directly by the manufacturer and may still be in the finishing process when you purchase them, leading to a short delay in shipment. In this case, the customer will be informed of any new delivery dates and reserves the right to continue with the order or cancel it. Guitar From Spain reserves the right to choose the transport agency it deems appropriate for each country and for each shipment. Delivery time is usually 2 - 7 working days, depending on the destination. Note that when exporting outside the EU there may be some additional delay due to customs clearance in the destination country. The time of preparation of shipments of guitars containing rosewood outside the European Union may suffer delays due to the management of CITES certificates. Guitar From Spain will do everything possible to make this preparation period as short as possible, but we can not promise to give an exact date, since the elaboration of these certificates does not depend on Guitar From Spain, but on the corresponding authorities. All our guitars are shipped with insurance. For this insurance to be effective, the customer must notify the carrier of any defects or significant breakage in the packaging and notify Guitar From Spain in a period not exceeding 24 hours from receipt of the order. Whichever shipment choice you make, we will provide you with a tracking number to track your package online. Shipping fees include handling and packing fees as well as postage costs. Import taxes and customs charges are not included in shipments to countries outside the European Union and must be paid for by customers in the country of destination. Handling fees are fixed, whereas transport fees vary according to total weight of the shipment. We advise you to group your items in one order. We cannot group two distinct orders placed separately, and shipping fees will apply to each of them. 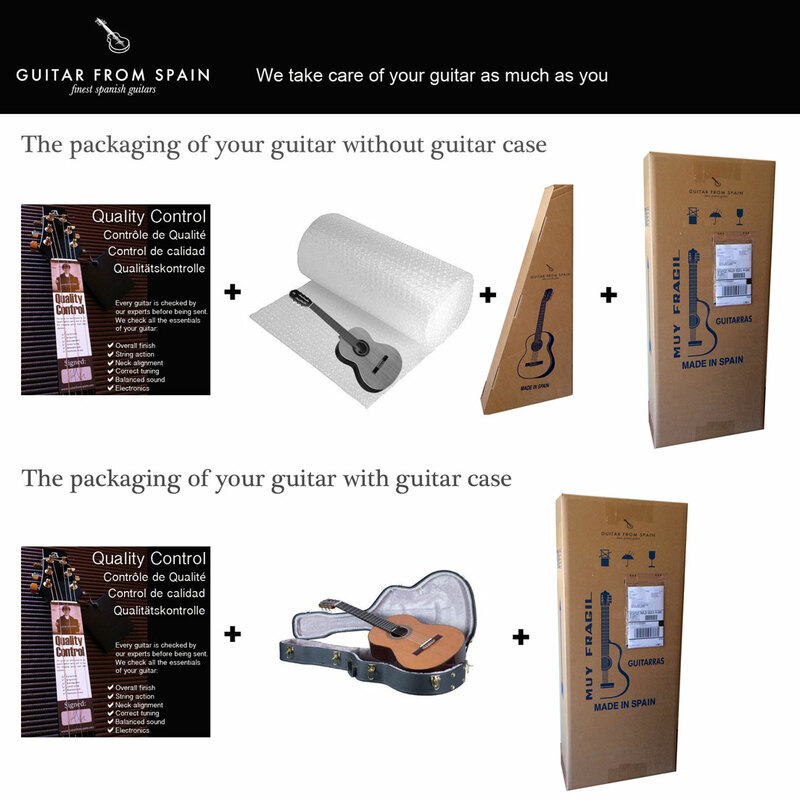 Guitar from Spain relies upon the services of third party couriers for all of our deliveries. We aim to carry out our dispatch and delivery promises on time, but there are inevitably a few rare occasions when couriers fail to perform the service that they are required to. We cannot be held responsible for the late delivery of an item in circumstances beyond our control. Where a parcel cannot be delivered, e.g. no-one at home, the courier will leave a card with a phone number to call to arrange another delivery time. If the parcel does not arrive when you are expecting it then please don't hesitate to contact us through our Contact Form and we will do our best to liaise with the relevant courier to trace the parcel's whereabouts. If your parcel cannot be delivered because nobody can sign for it within 3 days, it will be returned to us. Should we then have to re-send the parcel, we reserve the right to re-charge the cost of any re-delivery. If a box arrives in a damaged condition, please unpack it immediately. Damages must be confirmed in writing to the carrier, otherwise we can't accept compensation claims. It is the buyer’s responsibility to inform us within 24 hours after reception of a damaged item. All the guitars and accesories we sell at www.guitarfromspain.com are covered by the manufacturer’s warranty. The warranty period depends on each manufacturer as well as their conditions. The coverage of a faulty item under the manufacturer’s warranty depends on the sole decision of the manufacturer. In the event that you need to make use of the manufacturer's warranty, you will be responsible for the cost of carriage and customs charges to and from Emotional Trading S.L. Once the products are in our facilities, Emotional Trading SL will take care of the delivery and return of the products to the official manufacturer's service, without any extra shipping cost to the customer. - Please bear in mind that guitarfromspain.com does not have an in-house repair department, so it can take up to 6 weeks for us to process a warranty repair due to the additional procedural steps involved. The quickest and most practical way to resolve a repair under warranty is for the customer to contact the manufacturer directly, in most cases. Please use our Contact Form to inform us of your wish to return Products. Purchases made at www.guitarfromspain.com are subject to Spanish law, the applicable jurisdiction being the Courts and Tribunals of Madrid (Spain), in the event of any conflict or inconsistency.